With the Toronto Raptors loss to the Boston Celtics tonight, the Houston Rockets have officially clinched the NBA's best record and home-court advantage throughout the entirety of the NBA Playoffs. This accomplishment for the Rockets is a first in franchise history. With Toronto losing to Boston 110-99 the #Rockets officially clinch the best record in the NBA and home-court advantage throughout the playoffs for the first time in franchise history. This is something that matters to the Rockets for both the short and long term. Health can now become the trip priority for the final six games. While four of the games are against teams fighting for seeding in the playoffs, that is no longer a concern for the Rockets. Because of that, the team can continue to rest players. We're starting to see head coach Mike D'Antoni giving Chris Paul and James Harden off nights, and it is possible that will be the case for other heavy minute players. Even if the others do not rest much, Paul and Harden will certainly miss some of the final games. Paul is already expected to miss Sunday's game against the San Antonio Spurs. For the long term, home-court advantage is significant in the playoffs. Teams fight all season in order to have a possible Game 7 on their court. The players being able to sleep in their own bed, practice in their own facilities and having their home fans behind them is a big factor. Not having to travel as much is also a positive with the Rockets clinching home court. There is a real chance the Rockets can be in the NBA Finals for the first time since 1995. All of their hard work in the regular season has paid off. The city wants to rally behind the Rockets for a deep playoff run and ultimately a championship. 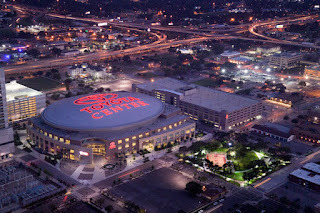 With home-court advantage now locked up, Toyota Center should be rocking for the playoffs.